Here’s how to update your kitchen on a limited budget. You’d love to redecorate your kitchen, but oh, that price tag! Backsplash tiles, new cabinets and granite countertops can cost way beyond your limited budget. Here are five ideas that will give your kitchen new life without breaking the bank. Paint or stain existing cabinets. If your cabinets look old and tired—or even if you just want a different color—you don’t need to replace them. Paint or stain your cabinets to give your kitchen a whole new look. Not only will you save the cost and labor of tear-out and the purchase of brand new cabinets, but you also will be kinder to the environment by repurposing rather than discarding. There are products on the market that will take you through the step-by-step of transforming your cabinets. But if you don’t feel like you’re up to the task, you can always hire a decorative painter who can do the job for you. Whether you want to do it yourself or hire the job out, check with your local paint store for the products or a contractor recommendation to accomplish the task. Update your window coverings. One thing that can really age your kitchen is an outdated window covering. If your tired kitchen curtains or sagging mini-blinds have been hanging at the window for more years than you can count, go with something new and a little innovative. Mini-blinds are still a good choice because they are easy to clean and maintain, but swap out your white or off-white minis for a blind in a more modern color and top if off with a sleek valance. Other choices that look great in a kitchen are wood blinds—either the real thing or faux wood for easy maintenance—as well as low-maintenance interior shutters, Roman shades or fabric valances. Use wallpaper. Nothing adds personality to your walls more than a beautifully designed wallpaper. Not only will it fit your budget, but it’s easy to clean—and these days, with nonwoven substrates, also easy to hang and remove. Kitchen themes abound in today’s wallpaper. Stop by your local paint and decorating store to check out some sample books. And if you don’t want to go with wallpaper throughout the kitchen, considering using it in a limited space—perhaps in your breakfast nook, or try a peel-and-stick faux tile in your backsplash area. Transform your countertops. Similar to the decision you make with your cabinets, you may want to consider painting your countertops rather than replacing them. Again, you’ll have the advantage of avoiding costly tear-out and replacement. There are several products on the market that are specifically made for countertops, giving you the look of a faux marble, slate or granite. Check your local paint store for availability of these products or for recommendations for hiring a professional contractor if you don’t feel you have the skills to do this yourself. Revitalize your walls with paint. The most economical way to update your kitchen is to change the wall color with paint. Make the room seem warm and cheery with a soft yellow or orange. Conversely, go with calm and soothing by selecting blue, green or gray. 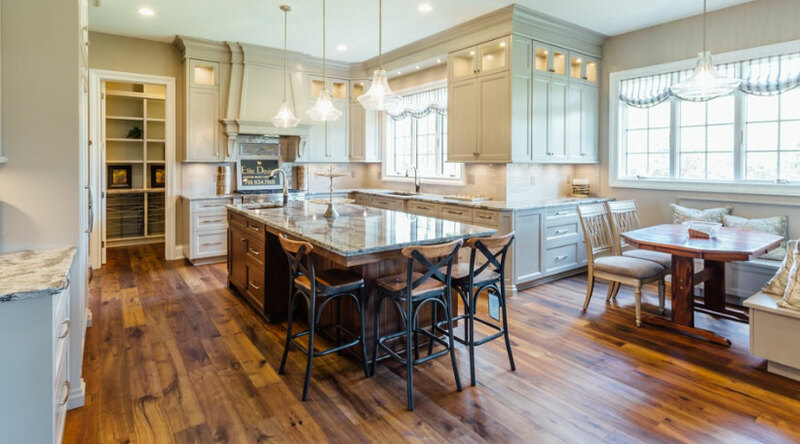 Make sure the colors you choose are compatible with other elements in the room, such as the colors you’ve chosen for the cabinets and countertops. Also, select a paint sheen that is easy to clean, such as satin or, for high-scrub areas like backsplashes, perhaps even a semi-gloss. Any or all of these ideas are sure to make your kitchen look brand new again. Using these economical ideas, you may have enough left over in your budget to go out to dinner occasionally—but as nice as your kitchen looks, you may just want to stay in and cook.